I'm so excited to kick off the Electric Challenge!! How did this begin? Well, my makeup artist extraordinaire pal, David, was watching an "episode" of Beauty Broadcast Live where I was debating whether or not to get the Urban Decay Electric Palette. He said I should only get it if I'm going to work in at least one color everyday for a period of time. He said my fellow taupe-lover Kristin Gehm should do the same! This got our wheels turning... what about a 5-day challenge? Kristin was up for it, so we each bought the palette, and we announced the challenge on Instagram yesterday for anyone who wants to do this with us! By the way, major props to Kristin for doing this challenge, even though she goes to work everyday in an office setting! I LOVE THAT! By the end of the week, I'll most likely do a review video on this palette, but each day I'll be sharing my #ElectricChallenge eye looks here on the blog. (FYI- this challenge is not sponsored by or tied to Urban Decay... it was our own idea to do this and we bought the palettes ourselves). Use at least one shade from the Electric Palette everyday for 5 days! Use whatever combinations you want, and throw in any other shadows or products you want. BUT - make sure you've worked in all 10 Electric Palette colors by the time the 5 day challenge is up! Post your pics on Instagram/Twitter/Facebook with the hashtag #ElectricChallenge so we can all get inspired by one another's creations! 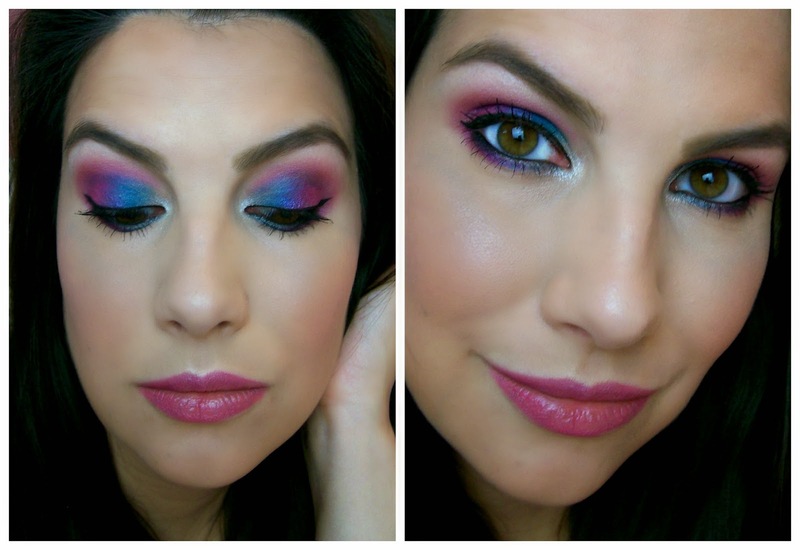 Today I'm working 3 colors into my look from this palette-- Revolt, Gonzo, and Jilted. Revolt is a metallic silver, Gonzo is a bright blue that comes off with a satin finish, and Jilted is a berry color that has an interesting blue-toned sheen. After priming my lids, I applied Revolt around my inner corner with the small side of the double-ended brush that comes with this palette. With a small, flat brush, I patted Gonzo on the inner two-thirds of my lid, slightly overlapping Revlot. I also pulled Gonzo up into the crease, and smudged it on the inner part of my lower lashline. Next, I placed Jilted on the outer part of my lid and into my crease. As I overlapped Gonzo a bit, an interesting purple tone started to come through. I love that! I also smudged Jilted on the outer part of the lower lashline. With a small blending brush, I lightly buffed Jilted above my crease, going all the way from the innermost part of my crease to the outer corner of my eye. Then I used a bare brush over the border to soften the edges as much as possible. Next I used a cream-colored highlight (Champagne by Sally Girl) under my brow. I also applied liquid liner with a small wing on the upper lashline, and a black cream shadow stick on my lower inner rim. I smudged it downward slightly to create a more blended effect with the colorful lower lashline. I applied two coats of mascara on my upper lashes, and one coat on the lower lashes. This is the finished look! This was my first time using the palette, and Gonzo was a bit darker than I expected... I typically might have put that shade on the outer part of my eye, but I'm actually really happy with the fade that was created into the pink! Also, lots of people are scared to use pink tones on their eyes for fear of looking sickly. One tip is to use black liner to really define the eyes, especially in the lower inner rim. 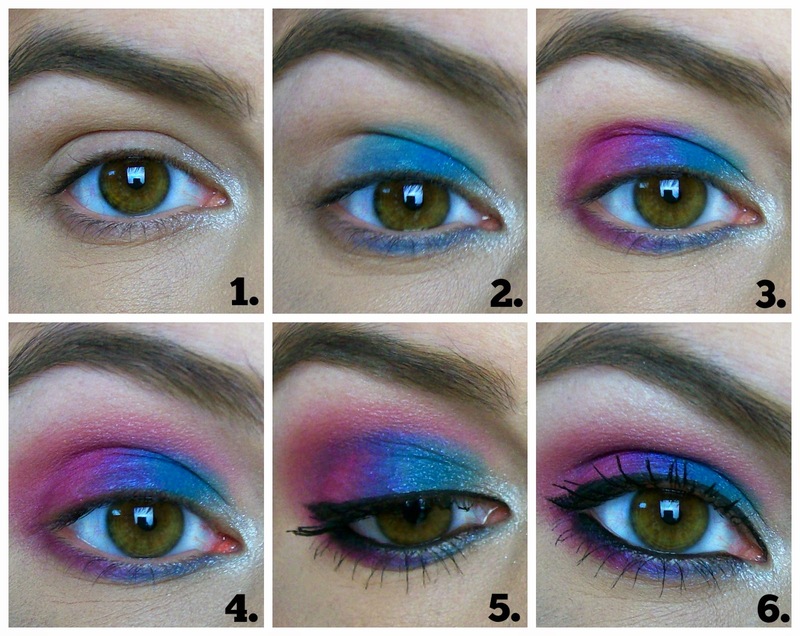 That way the pink doesn't look like it's coming from YOUR eye- but rather an effect with your eyeshadow. I hope you enjoyed this look! I'm so excited to play with more colors tomorrow! I think this challenge is a great way to get out of a neutral-shadow comfort zone, and you also might be surprised at how flattering some shades are that you've never tried before. However, I think it's important to point out that loving neutrals is totally fine! Sometimes I think we (as makeup lovers) equate creativity to color... when people can be equally creative with more muted tones as well. 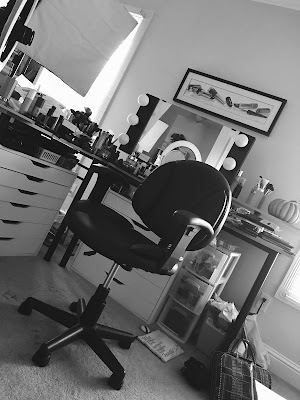 The beauty of makeup is that there aren't rules (unless you choose to make them for yourself! ), and it's YOUR face, so do what makes you happy! For me, this is just an opportunity to look at color differently, explore new combinations, and try something a little outside the norm. Just remember- color isn't the only way to exercise your creativity. Even a subtle technique change that you're experimenting with can tap into your creative side... not just the "shout it from the rooftop" colors- although it may be more obvious to others. Beautiful art happens in black & white as well as color. The sweet potato chips from Aldi are AWESOME. My lunch today is going to be an old school favorite- a tomato sandwich. 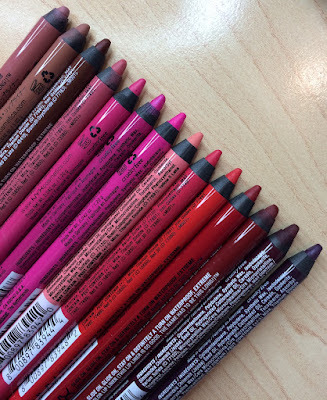 Many people have been asking me about the new Milani Bella eyeshadows... and yes, over the weekend I did get them! Reviews will be coming- but probably after this challenge wraps up. I think I have a thing for plane-related action movies lately. In the past couple of weeks we've watched Con-Air and a newer one-- Non-Stop. I've also seen that one with Denzel Washington- I think it's called Flight. It's not like we're specifically seeking out these movies, (although Con-Air is pretty awesome!) but we just keep watching them! Love this look! Great post! Also loved the comment about equating creativity to bold colors and not so much of the neutrals. I know I'm guilty of that, but you're right, you can be creative with neutrals as well. What camera did you use to take the pictures of the 6 step makeup application? Or did you use your iPhone? I commented over on your FB page that I wish Urban Decay would come out with a more balanced palette - along the lines of Ammo or the Book of Shadows range - but with the amount of shades of a Naked palette. My go to look is either Mildew or Stash (eyeshadow exclusive to Vice 2) with either Mildew, Junkie, or Stash liner on the bottom lash line, but I'm working with so few options in that shade range, it would be nice to have a palette that's colorful but is also usable in a day to day look, with some blues, greens, purples that can go to the lengths of Electric but can also be toned down. I love the look! 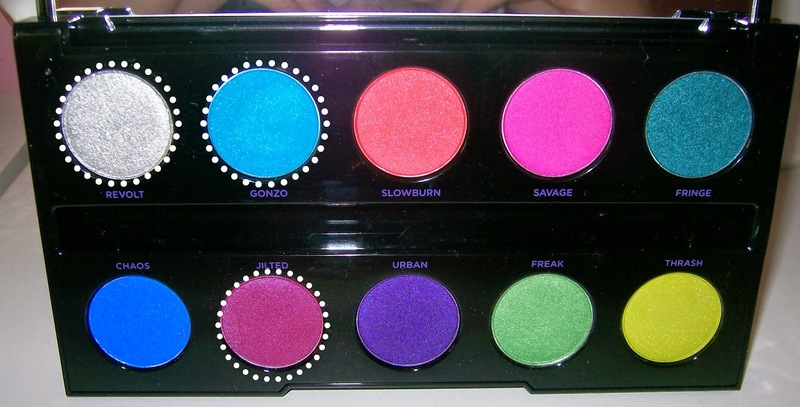 I am tempted to buy this palette but the colors are so bold. I love color but these are bright! Are the shadows powder or cream? I've put off getting this palette because I didn't think I would get much use out of it... but now I'm seeing wearable looks left and right. Absolutely gorgeous look! I love how beautiful and bold this makeup look is! I just picked up this palette and I am looking for different ways to put it to use. Thanks for the inspiration! This challenge is such a good idea, I often love the look of bold colours in palettes but I'm way too much of a neutrals girl to ever buy them. I think it's great that you said at the bottom of your post that art is done in black and white as well as colour, as it's something I think a lot of makeup lovers forget. I really look forward to seeing what other looks you come up with for this challenge! This is just BEAUTIFUL and makes me want to bust out my colorful palettes first thing tomorrow morning! These colors look great on you. I love this look. What do you think of that mascara? I bought it, but find that it is kind of a pain to apply. I'm pretty sure this palette is gonna go out of stock on Ulta and Sephora by the end of this week cause this def makes me and I'm sure everyone else want it! That's a beautiful look. Props to you for being so brave and wearing such bold colours! this is so gorgeous! 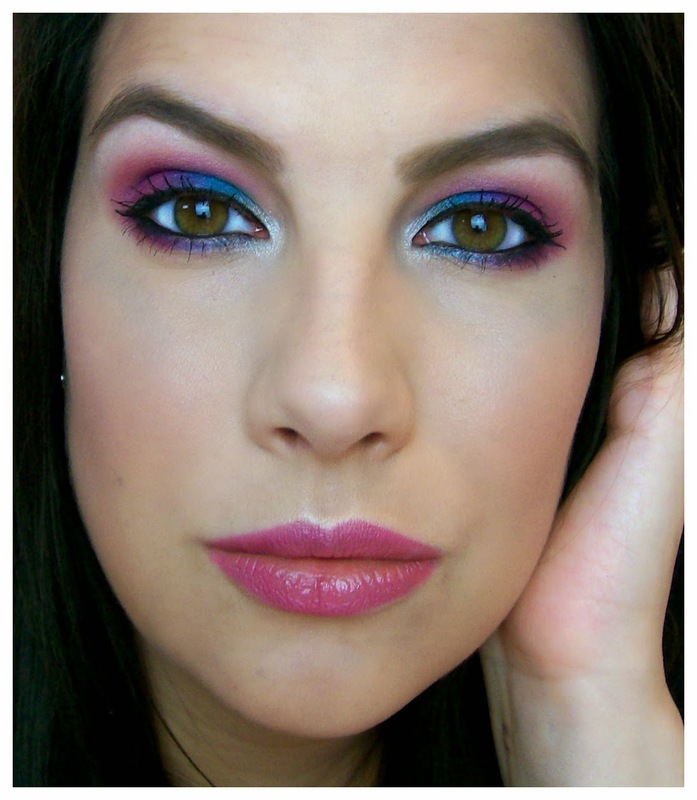 I love how the blue and pink swatch and the inner corner silver is stunning! Funny how I never realized until this post that your eyes were hazel. Those colors really bring out the gold in your eyes! Gorgeous combo on you. Great job, Emily! I love this idea, and seeing you in such bright colors! For some celebrities getting comfortable with being famous has been tough - that whole side of it, like the loss of anonymity, and the loss of privacy. I love all of these movies as well!!! They all have very great actors in it! This looks great, Emily! Don't you just love shopping at Aldi? I shop there every week. Also, is the LA Girl Lip Paint comparable to the Too Faced Melted Lipstick? love this look! the blue looks great with your eyes! Love the 80's retro feel of this one! Wow! love the look and love the step by step images!!!!!! One of only a few days long holiday. It is time to help you rest, relax, go out and gather friends and relatives. Love the eye makeup :) Thank you for sharing.